I've just realised that I haven't mentiond my first Brother Demonstration weekend which will be held from Friday 2nd December until Sunday 4th December and I will be open late on Friday evening until 8pm for anyone who can't get along during the day. 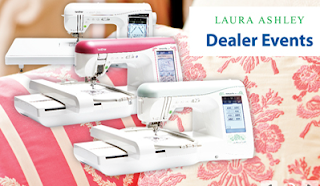 We will have all the new Laura Ashley sewing machines available for you to have a play with, including the fabulous Innovis Ie. Do come along to see what these machines are capable of and, if you book a time slot prior to the event, you will receive a free gift just for coming. You are welcome just to turn up of course, but if you do book you will guarantee a place on a machine of your choice. There is no obligation to buy, and it is an opportunity to have a play so I look forward to seeing you there. Book Signing - Another First!